With access to over 400 million members, LinkedIn is a great lead generation tool. The platform which is originally created for connecting professionally has a great potential for finding the perfect prospects who are interested in your product or service. When you’re working in a sales team, generating new leads to build your sales list becomes a daily task. Our Chrome Lead Clipper helps capture leads from LinkedIn, Gmail, Facebook, Twitter and any other website to Revamp CRM . Find a lead online > put its data into your CRM > call/email the lead > log the activity – this process has never been faster! You’ll increase your lead generation efficiency! It is the ideal Chrome contact clipper. You can import all your LinkedIn connections at once via using a CSV file, it’s both fast and easy. 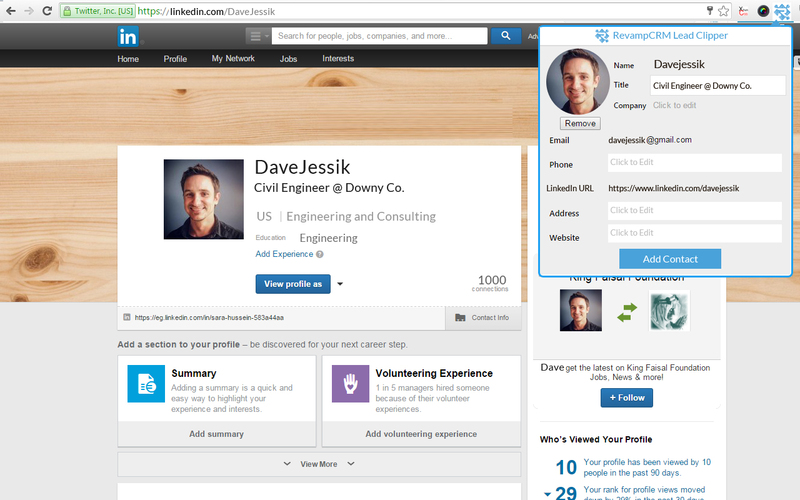 All you need to do it to go to your Revamp CRM account > Navigate to integrations > and click on the LinkedIn button. You will be directed to LinkedIn to export all your contacts in a spreadsheet, then you’ll be able to upload this CSV file in Revamp CRM. and don’t worry, we made it super easy. Your CSV will be mapped automatically and we will import your contacts in a minute. Integration: Stop wasting your time on data entry and import all your contacts and leads from 26+ to your CRM account. Smart Filters: Use contact management tools and filters to sort your contacts into different Segments and Lists. Email Marketing: Use our Email Marketing Automation and Campaigns to send better targeted emails. Automatic sync with another email marketing tool: Export Revamp CRM Lists to your email marketing tool, and enjoy our automatic sync between Revamp CRM Lists and your email marketing Lists.